It's been a great week with all of the scrapbooking & pickle jokes, the poems and the photos- you've all been awesome! Our week of giveaways has finally come to an end but we hope you'll stick around for more fun times! Keep up with Lance's adventures around the world and at home (and of course loads more giveaways are to come)! Thanks again to everyone who stopped by to play along! Remember to check back often for more fun here on Lance's blog! And now, on to our final winners of the week! I hope they pick my name. So I can win too! Rusty Pickle products are fabulous. I wish someone near me sold them....I will keep ordering on-line as long as they keep creating. Thanks for sharing. Here's to you picking my name!!! Congratulations, Christine and Theresa!! Please email us with your mailing addresses. Thanks again, everyone! Please continue to share your photos of Lance as he'd love to include them here on his blog! Have a great weekend! First long and sour, then round and sweet. 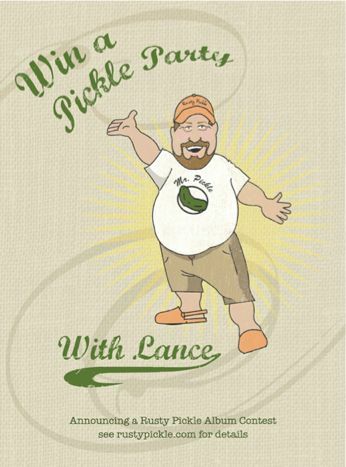 Now Lance has more Rusty Pickle power. Congratulations, Stacey!! You are the lucky winner of a French Market Paper Pack & Stickers! Please email us with your mailing address. A Memory Trends Show Pack! AT LEAST one Acrylic Album! If you've ever taken a class with Lance, here's your chance at this great prize! Leave a comment with a link to your photo of Lance and we'll choose a winner at random tomorrow!! Don't have a photo of Lance? Leave a comment and we'll also choose one lucky winner to receive an acrylic album! Good luck, everyone! We have a new winner in yesterday's random drawing and a new prize up for grabs today! I'm so loving the new "French Market" paper line- beautiful, rich, earthy colors- especially those with the lucious "RUSTY" colors! I cannot wait to get my hands on them! Congratulations, Irene!! You are the lucky winner of a Chocolate Kisses Paper Pack & Stickers! Please email us with your mailing address. A French Market Paper Pack & Stickers! Leave a comment with the word "PICKLE" in it and we'll choose a winner at random tomorrow in a new post along with another giveaway!! Good luck, everyone! You folks are funny! :) Thanks for sharing your pickle jokes with us! We have a new prize up for grabs today in our random drawing along with the winner from yesterday's prize! I'm the first! Yeah! Here's a few! Q: What's green and wears a mask? Q. What happens when a PICKLE is bored? A. He becomes very DILL! Congratulations, Jennifer!! You are the lucky winner of a Rusty Pickle Circle Acrylic Album! Please email us with your mailing address. A Chocolate Kisses Paper Pack & Stickers! Leave a comment with the word "RUSTY" in it and we'll choose a winner at random tomorrow in a new post along with another giveaway!! Good luck, everyone! Thanks for the laughs, everyone! Lance will surely have some new jokes to share in his classes now! We have a new prize up for grabs today in our random drawing along with the winner from yesterday's prize! Here you go Lance, have fun choosing a winner !!! Q: a tree falls onto a scrapbook in the forest, and there's nobody around to hear it, does it make a sound? A: It all depends. Is the tree made of acid-free bark? Are the leaves made of lignin? What's the pH level of the tree? Congratulations, Anna!! You are the lucky winner of a Rusty Pickle Scalloped Acrylic Album! Please email us with your mailing address. A Rusty Pickle Circle Acrylic Album! Leave a comment with a PICKLE JOKE and we'll choose a winner at random tomorrow in a new post along with another giveaway!! Good luck, everyone! 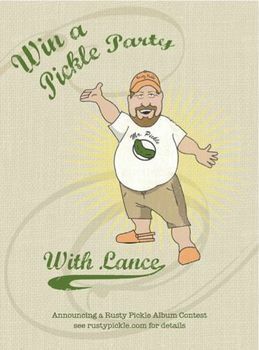 Lance has been really excited about getting his own blog for a while now and with the recent excitement surrounding the launch of the Rusty Pickle Chefs' Blog, he decided that he wanted to get in on the fun! If you've ever met Lance, you know that aside from pickles, cheese and jokes, he also LOVES to GIVE PRODUCT AWAY! All of our prizes will be new product from the latest Memory Trends Tradeshow! Giveaways will be held all week long with Friday being the last day- and of course, we'll be sure to put somethin' special up for grabs that day! So now, without further adieu, let's get this party started! Leave us a comment WITH A GREAT SCRAPBOOK JOKE here on the blog, within this post, and we will choose a winner at random tomorrow morning to receive a (drumroll, please!).. FREE RUSTY PICKLE SCALLOPED ACRYLIC ALBUM! Remember to check back tomorrow morning to see if your name was chosen.. and to see what cool little prize we'll be giving away next! Good luck!! This is a themed album contest. The theme is "Story of..."
*Dinner with Lance for you and three of your friends. *Class with Lance at your local scrapbook store with you and twenty of your closest friends. *Win a spot at our annual design team chef retreat. *Albums must use 90% Rusty Pickle Product. * All albums must be submitted on contest site on or before August 17th. *Twenty-five semi finalists will be notified and asked to mail their album to Rusty Pickle to be received by September 1st. *Semi Finalists albums will be featured in a Rusty Pickle Idea Book. 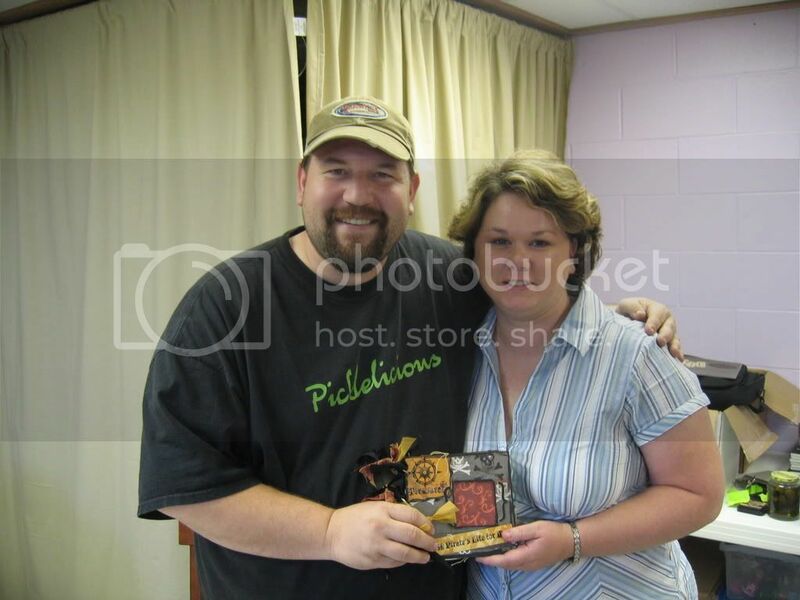 If you need assistance on finding where you can purchase Rusty Pickle product email office@rustypickle.com. *A weekend retreat with Lance at your store. There will be a Friday night class and crop and four Saturday classes. Classes can have twenty students each. Please feel free to e-mail tasha@rustypickle.com with questions.